In my time at HootSuite, I’ve seen a sea change in the way that businesses approach employees’ social media use. Not long ago, few things were more taboo than chatting or tweeting on the job. Lots of organizations even cracked down on what employees posted on personal Facebook pages in their free time. This seems fundamentally backward to me. Depriving employees of social media is—at the end of the day—just bad business. Recently, some big companies have gotten this message. Nearly three-quarters of all Fortune 500 companies are now active on Twitter. According to the Economist Intelligence Unit, 80 percent of executives now believe their brands get more sales using social media. These companies have embraced social media in the workplace and haven’t looked back. This makes good business sense for a lot of reasons. Social media’s power as a marketing tool is already well understood. But I want to focus on something a little bit different: how social media can change the culture within a company and boost the bottom line in unexpected ways. 1. It helps you hire better people. 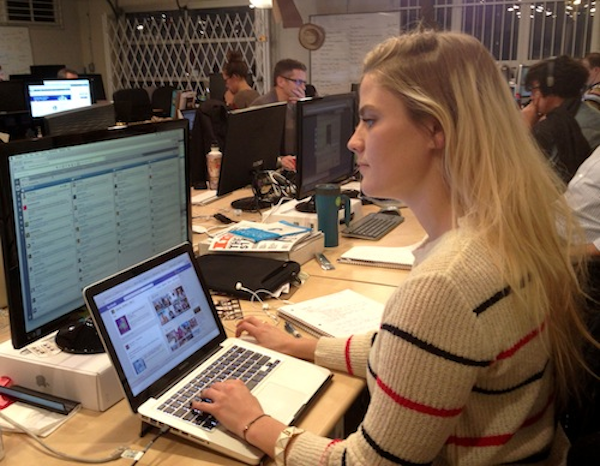 At HootSuite, which now has more than 200 employees, everything starts with how we hire. Our HR department tweets job openings from a dedicated HR Twitter account. Applicants tweet us back—The entire process is public, transparent and out there for everyone to see. This fosters community among job hunters and staff right from the start, and we get to know candidates on a more personal level. Sometimes, this can be very revealing. Earlier this year, we did a phone interview with a promising applicant for our development team. Afterwards, we discovered this tweet in his stream: “going to a phone interview with @hootsuite and I am drunk after a few hours in the ‪ #congress2012‬ beer tent.” A personal side of this fine young candidate we would never have known was revealed in living color. If you’re wondering, he didn’t get the job. 2. Social media breaks down old hierarchies in the workplace. Social media has also been an equalizer in our company—closing the gap between management and entry level. Around 75 percent of our new hires are internal referrals, which blows away the industry average for high tech in our region, and this is due to the dialogue we have with our own employees on social. Anyone—including new hires and interns—can tweet me or our other department heads at any time. Twitter, with its brevity and informality, makes it possible for me to engage with hundreds of my employees, in a way that would be inconceivable on email or in person. HootSuite employees hosts monthly parties called parliaments. These folks held a murder mystery, and dressed the part. And I’m proud to say that HootSuite employees are tweeting, Facebooking, Instagramming and updating their LinkedIn accounts pretty much 24/7, both inside and outside the office. Importantly, these aren’t official company accounts; they’re employees’ personal networks. When we celebrate a milestone like racking up another million users or a birthday or one of our monthly Parliament parties, thumbs are blazing and camera phones are flashing away. 3. It empowers employees to become brand evangelists. The bottom-line benefits of this kind of social engagement are huge. At the end of the day, some of the most powerful advocates any brand has are its very own employees (I’m assuming here that you’re part of a company people like to work for—If not, then it’s time for some serious soul-searching). We’ve seen this firsthand at HootSuite. There’s absolutely no requirement that our employees chat us up on Twitter or LinkedIn. But they share their experiences all the time on social networks and they blog about their work here—reaching an influential audience of colleagues, peers and potential clients both inside and outside the industry. We’ve recently developed an internal social network called Conversations that lets employees post back and forth on central forums and amplify appropriate messages on Twitter with a single click. Importantly, all of this is a two-way street: Employees are able to build their individual brand and following while cultivating the company brand at the same time. As a company, you can either hammer your user base with official company content (yawn)…or you can leverage your employees as empowered evangelists to reach people on their own turf and on their own terms. If you have 200 employees, and they each have 500 followers, then altogether you have a collective reach of 100,000 people. In this context, social media is hardly a threat. It’s a way to seek out better hires, improve internal communication and turn employees into brand ambassadors. And I’m not the only one who sees these benefits. A recent McKinsey report estimated that more effective use of social technologies in many of these same ways could unlock $1.3 trillion in value for businesses. Want to learn more about using HootSuite for your business? Visit the HootSuite Enterprise site, and ask us for a demo.